Exposure to more potential clients. Ability to link to endless amounts of information. Ability to target specific audiences. When a small business joins an online directory, there are some important pieces of information that should be included and some critical things to keep in mind. If you want to maximize your exposure in an online directory, then you need to make sure the basics are covered. The link you will include in your online directory listing will go straight to your website. If you want to retain the traffic that your website gets from the directory, then make sure you clean up your website. Eliminate any unnecessary images or animated pictures, make sure the colors are easy on the eyes, make sure all of your content is relevant and check to make sure that all of the links on your website work. You only get one chance to make a first impression and your website needs to be ready to go when you get a directory listing. The more contact options you give people, the more likely they are to contact. Many people like to look up companies on the Internet and then call those companies. That is why you need to have that information available. Some directories allow you to add a picture for an extra cost. Images are powerful tools on the Internet, and you should always include an image whenever you can. It can be your company logo or it can be a picture of your most popular product. But when you have the option of adding a picture to your listing, then you should always take advantage of that option. Make sure that the picture has something to do with your company, is not offensive and is something customers can easily see with the picture size given by the directory. 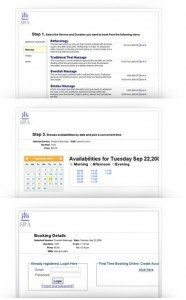 Visit http://www.timepicks.com to get all the info you need to start booking appointments online.